Want discounts on DJI, AeroVironment and other commercial products? How about discoutns on drone events? Sign up for our news letter. As a Part 107 pilot, you probably do some cool stuff. Have you found yourself without adequate space to test, do demonstrations or trainings? Well, we've got you covered. 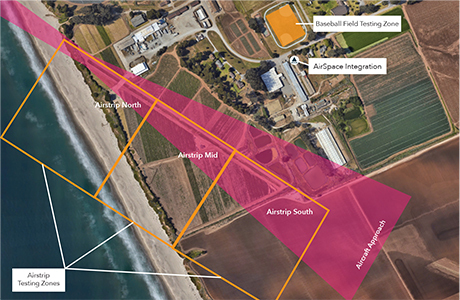 AirSpace Integration has over 300 acres of dedicated testing/demonstration sites. Plus, we have built a community of like-minded developers, who push the boundaries of innovation and technology. Our co-working space and community is located close to Silicon Valley and nesstled amungust active agriculture. Oh, did we mention we have our own private beach and airstrip? We have the space you need for your drone development team. Come fly!